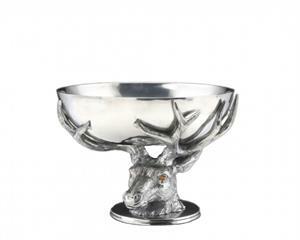 Gaze into the incredible depth and detail of this Antler Centerpiece Bowl from Arthur Court. A deer head with fiery orange eyes mounts on top of a circular base as antlers root up from its pedicle to form intricate support beams. Realistic features and expert craftsmanship make this handmade, aluminum bowl a commanding presence on any table. Size: Diameter: 12.0" / Height: 8.5"